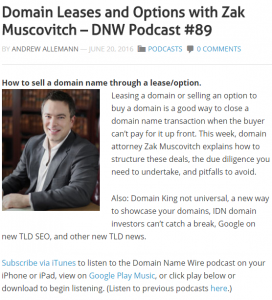 I am relatively new to podcasts – listening to them, and certainly being interviewed on one, so I was very excited to be interviewed by Andrew Allemann for his DomainNameWire.com podcast. If you are anything like me, you visit Andrew Allemann’s excellent domain name news website, about a dozen times a day to keep on on domain name industry developments. 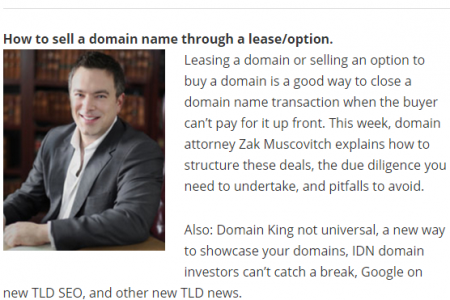 Andrew recently wrote that he had a positive experience in closing a domain name option deal, and reached out to me to join him for the interview. 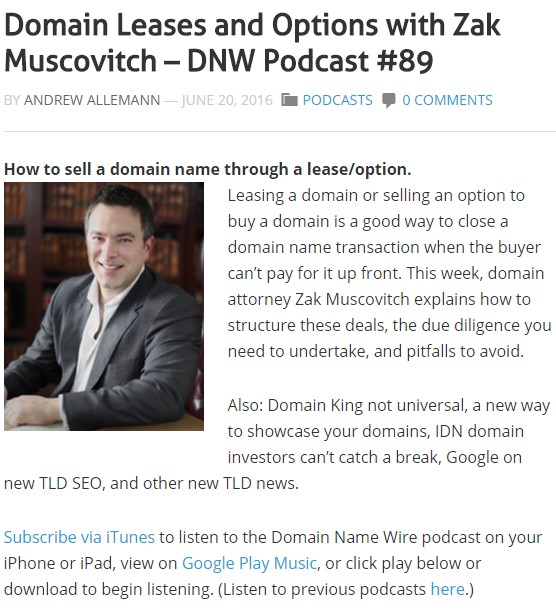 If you have thought about domain name leasing or optioning yourself, or wonder what it involves, listening to this podcast is a great and easy way of getting quickly up to speed on the dynamics and issues surrounding the basics of domain name leasing and options. We cover a lot of the pitfalls and considerations, particularly from a domain name owner’s perspective. You will hear about due diligence, various structures available for domain name leasing, escrow of domain names, determining payments, risk management, leasing disputes, and other interesting issues. ← Planning on Going to India for DomainX or ICANN?